THEM Anime Reviews 4.0 - Kobato. Notes: Based on the manga by CLAMP, currently running in Newtype Japan after a short-lived run on Shogakukan's Monthly Sunday Gene-X. The manga's currently licensed in North America through Yen Press. Kobato Hanata is a sweet, though naive and fairly dense girl with a mission; to collect healed hearts in order to fill up a special jar. Once it's full, she can use it to grant her wish to visit a special place. Accompanying her is a gruff, talking stuffed dog named Ioryogi. Despite finding Kobato's behavior annoying at times, he tries his hardest to convince her to reach her goal, which she has only one year to achieve. Early on Kobato ends up working at a local kindergarten, which has two employees: the blunt, sarcastic Kiyokaze Fujimoto, and teacher / principal Sayaka Ohara. Will Kobato fulfill her goal of filling up the bottle in a year? Cute series are fairly rare these days in anime. And by cute I don't mean series where the cast are walking moe blobs known more for stock personalities or catch phrases than actual characters. (*coughK-On!*cough*). I also haven't really been into any CLAMP anime adaption since the first season of Cardcaptor Sakura. Fortunately, I'm happy to report that Kobato. is not only a cute, touching series, but also possibly my favorite CLAMP anime adaption to date. A large part of this is courtesy of Kobato, who's one of the cutest, kindest, and sweetest characters I've seen in an anime in a very long time. Her infectious personality nearly carries the show on her shoulders. Overly cheerful girls can get annoying, but the writers of Kobato. are very careful to not make the series' namesake too cloying or sweet; when the show needs Kobato to open up, it lets her. There's some fairly big character development for her as the series goes on, a rarity in slice-of-life anime. Kobato's stuffed animal guide, Ioryogi, isn't what he seems as well. Unlike Kero in Cardcaptor Sakura, who got along fairly well with Sakura 98% of the time, Ioroygi not only does not get along with Kobato, he often ditches her, forcing the girl to solve her own problems. (Gasp!) A recurring joke of his setting on Kobato on fire is a wee bit extreme for something that's supposed to be humorous slapstick, but thankfully it's toned down as the series continues. Fujimoto, the main human lead, is a sarcastic grump, but not a detestable one. He's quite a busy man, too. He does slowly get along better with Kobato as the series goes on, and he's selfless as often as he is "mean" to her. Sayaka, the owner of Yomogi Nursey, is kind of bland until later on in the series, where she has to deal with a certain someone from her past. 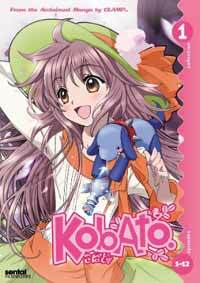 Kobato., like Angelic Layer, Chobits, and X/1999, was an anime based on an unfinished manga at the time that it aired. Fortunately, the series doesn't have too much fluffy, annoying filler, and even the filler episodes are pretty good. The writers even make the very nursery Kobato works at to have a purpose in the story-line, especially in the last quarter of the series. Kobato. moves at a brisk pace from start to finish, with nary a drop in quality throughout. Typical of their recent works, a lot of other familiar CLAMP characters appear throughout, whose fans will appreciate the high level of fan service / references. Kohaku from the manga Wish appears in several episodes, Chitose from Chobits is the landlord (accompanied by her now non-robot daughters from said series as well), Syaoran, Fye, and Kurogane from Tsubasa Chronicles appear in episode 20, and Yumi from Chobits also appears in episodes 11 and 20. Unlike the plugs in anime like Lucky Star, though, Kobato. 's cameos never distract from the series, and not once did I find it jarring to see other CLAMP characters throughout. While the animation isn't the best in the world, the actual art is typical Madhouse quality - in other words, great. Kobato's outfits also change every few episodes or so, all of them very cute. Even the thick, black outlines used for Kobato when she's a chibi (or Iroyogi when he's angry) are adorable and well-done. The music is great, full of (usually) fitting background music, and the voice acting is quite good, especially Kana Hanazawa's adorable performance as Kobato. I'm not too keen on the insert songs (Kana Hanazawa isn't the best singer in Japan), though the opening / closing numbers are quite good. So yeah, I like Kobato.. A lot. I can't remember the last time I watched an anime that charmed me this much. I also can't think of a single major complaint, which almost never happens with anime I watch. So for you, Kobato., I'm going to give you 5 stars. Or, as Ioryogi would do with a brush on Kobato's face, give you 100 points. Recommended Audience: Perfectly acceptable for all audiences, like most anime that aired on NHK. The only slapstick is Iroyogi setting Kobato on fire when angry, but it's played for laughs and she never actually gets hurt. There's a scene later in the series where Iroyogi gets damaged, but there isn't blood.